Atlanta Street Fashion and Atlanta Bicycle Chic, both I which I love to read, when he very kindly shot the look below featuring a fair trade sarong and accessories, all from our Ten Thousand Villages Atlanta store. The look was photographed by Mr. Adams, styled by 'yours truly', and modeled fearlessly (& last-minute) by one of the most hard-working and delightful young women I've had the pleasure to work with. The sarong shown is $25 and hails from the wonderful women of Blue Hand Batik, in Bali, Indonesia. "Blue Hand was founded by husband and wife team, Tracy Tang and Arnie Cullipher in 1994. They were introduced to the art of batiking while backpacking in Bali. The first few years, Tracy and Arnie lived in Bali. They taught themselves to speak and write Indonesian. Now they travel to Indonesia as necessary to oversee production and develop new designs. Arnie’s parents, Lou and Diane, joined the organization in 2001 establishing the Service Center to conduct order fulfillment and customer service. Blue Hand joined the International Federation of Alternative Trade (IFAT) in 1996 to ensure our customers of our commitment to fair trade practices. In 2004, Blue Hand was among the initial companies to be accredited by IFAT (now WFTO – World Fair Trade Organization) as a Fair Trade Organization. Blue Hand is committed to and adheres to the WFTO principles. Blue Hand is a nickname we gave our batik artists whose hands are often blue from working with indigo dye. We are proud of our sarongs and blue-handed artisans in Indonesia. Blue Handsarongs are made of the highest quality rayon producing a wash-and-dry garment and with no fading or shrinking. The fabrics are created through the traditional Indonesian art of batiking. This batiking process involves applying hot wax to the fabric, dyeing the fabric and finally boiling the wax off to reveal the image underneath. The completed fabric dries in the sun. Each color represents a dyeing and waxing process. All is done by hand. Batik is an artisan’s handmade interpretation. Each batch will have slight color variations, but that's what makes it unique." Hand-batiked in an array of colors and patterns, the sarongs measure 44" x 60" and in addition to beach-wear can be worn or used in many different ways. I always travel with at least one and use them as airplane throw, hotel lounge-wear, emergency clothing for lost luggage, privacy curtain, modesty covering in temples and churches, picnic blanket, and eventual "thank you" gift to hosts and new friends. Even the one that I wore while locked in a Paris attic hallway for 10 hours was left for my hostess (after laundering, of course) in thanks for her hospitality and as an amusing reminder of my day of contemplation in lieu of sight-seeing. If you are of small to average female build, there are multiple ways to wear a sarong as a dress, as seen below on tripstyler.com. But if that isn't quite your style or, like me, your proportions are not conducive to it, try it as a wrap skirt with basic tee, a draped jacket with shift dress, flowy halter top with jeans, or just rock it out at the beach Balinese-style knotted around your waist. 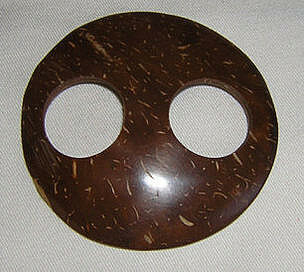 Securing the back of the sarong dress is this coconut shell button buckle, also from Blue Hand Batik, which sells for around $5. Buckles are a nice way to dress up your sarong as well as offering a neater option for securing it over a large, unruly knot. New to the Blue Hand collection are their 22" x 60" scarves, which are the same length and style as the sarongs, but half the width, which works perfectly as a short wrap or tie skirt as well as a neck or head scarf. You can find their products in fair trade retail shops including Ten Thousand Villages stores, throughout the US and Canada.